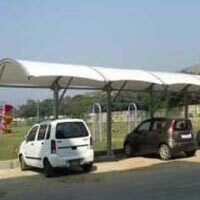 Car parking tensile structure are effective to be used for various applications such as signage, roofing, etc. Energy efficiency, light and heat reflection, great sound reduction, reduced lighting requirements, easier packing and transportation make us leader in the field over our rivals. 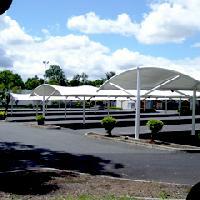 We are named among the renowned Manufacturers and Suppliers of Car Parking Tensile Structure . It is manufactured using high-grade basic material. 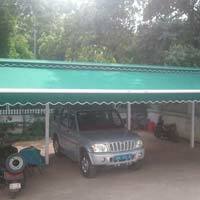 Thus, our Car Parking Tensile Structure is the perfect option on which buyers can easily rely. When it comes to delivering Car Parking Tensile Structure, we use fast shipment modes so as to ensure its timely and prompt delivery at the customers’ end. 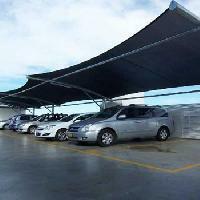 The car parking structure that protects your vehicle from outdoor weather. 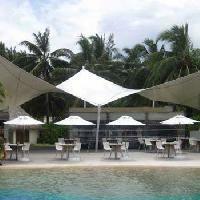 Top quality raw materials are used to manufacture these structures, so that they have durability and a longer life. 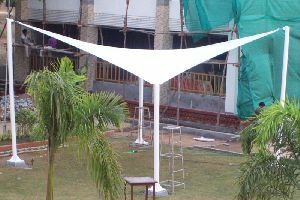 They are available in various colors, and different shape of structure such as, Arch shape, vault shape, hyper shape, cantilever structure & conical shape. 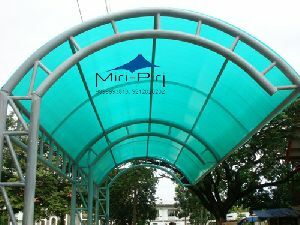 Material using membrane PVC coated & PVDF 5-15 years warranty. 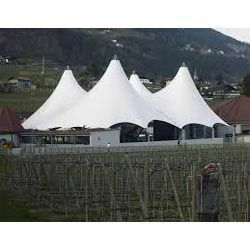 Other ways, during which these structures is used, are for covering trade truthful stands, shows, exhibitions, chateaux, circus tents and awnings. 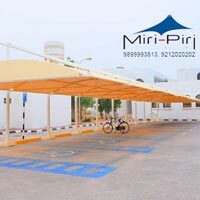 We are among the eminent manufacturers and suppliers of Car Parking Structures in New Delhi, India. 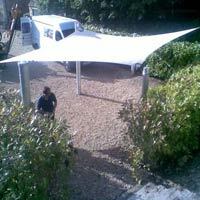 These structures are known for their easy installation that depends on required design, sizes and areas. We offer these structures in varied grades and dimensions as per the clients' diverse requirements. For efficient area coverage, these car shades provide protection from harsh sunlight and damage of vehicles. Miri Piri Sheds & Structures Pvt. 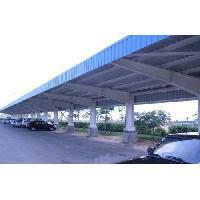 Ltd is well known manufacturer and supplier of a range of car parking structures. 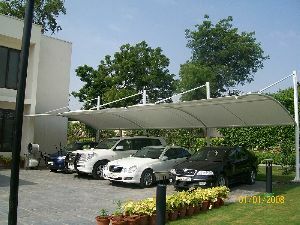 We can customize these car parking systems on the specific requirements and plan provided by customers. Our car parking systems are acclaimed by a number of customers due to their easy process of installation with minimum maintenance. Hailing from Bareilly(India), the company is known for providing only quality products at reasonable prices. Advanced transportation facilities, efficient workforce, on time delivery of the products make us stand out from the crowd. 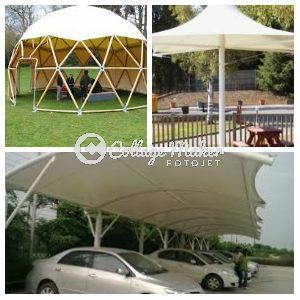 Obtain quality-grade Atrium Tensile Structures from us at reasonable prices, as we are reckoned among renowned suppliers of the product. We are backed by a quality control wing that strictly check the lot at all stages right from the production to the final dispatch. 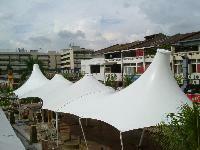 We offer superior grade Atrium Tensile Structures for temporary roofing solutions in party, banquet, wedding etc. 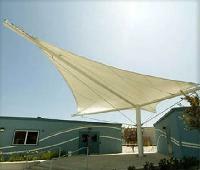 The Cantilever tensile structure is a striking free standing permanent structure which is ideal for open spaces especially in outdoor learning and play environments. 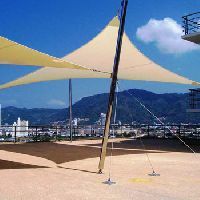 This structure which uses an exclusive waterproof material is able to cover large areas due to its ability to span up to 4m and is supported by maintenance free tubular steel posts. Tensile membrane structures and roof fabric structure are manufacturer, supplier and exporter erected in workshops and subsequently transported to their final destinations in large containers. These are composed of multiple sections or modules, that are assembled together to form a complete structure. 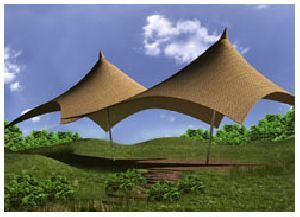 These structures can be used for various applications, at both commercial and residential settings. B & V Membranes( Unit Of B & V Agro..
With vast industrial experience we are involved in offering an extensive range of Tensile Membrane Roofing Structure. These are produced using best quality material which we sourced from the authentic certified vendors of the market. These are widely used in various places and have long life. Offered products are highly acclaimed among our clients due to their superior quality, high strength and rugged construction. Aakruti Tenso Structures & Facades .. 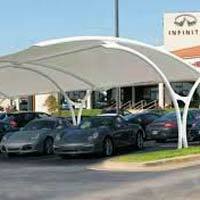 The tensile structure covers efficient area and provides protection from harsh sunlight that can damage the vehicle. 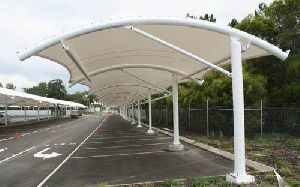 These shades are designed to provide required protection to the vehicle while parking. 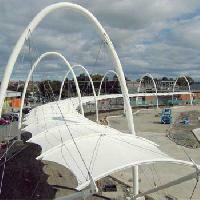 Tensile fabric is a term used simply to describe fabric that is under tension, i.e. being pulled in opposing directions. It can take many forms, though its generally based around three shapes: the Cone (or fluted cone), the Double Curve Barrel Vault and the Hypar (or hyperbolic shape).